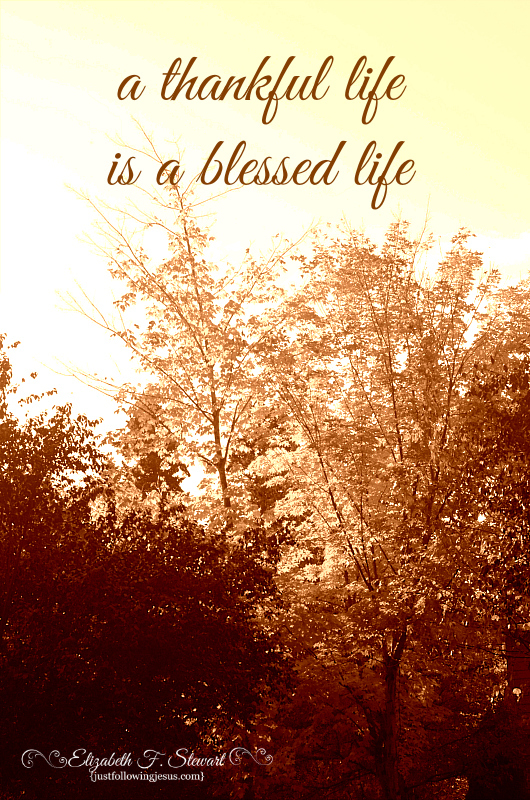 A thankful life is a blessed life! instead of under a curse. in gratitude for the abundance of all with which He had blessed you." Evidently, serving God with a joyful, grateful mind and heart is a big deal to God. It should also be a big deal to us. Wonderful post, Elizabeth! I think when we write down what we are thankful for even the tiniest can become great. I think you're right Anne! You are a busy, blessed lady. Thanks for sharing. I haven't forgotten about coffee with you! Beautiful photos and a wonderful post. Thank you for this word on Sunday. !! !Feeding On God's Faithfulness!!!! Love you. Amen! I hope you're making your list and that I get to take you out to coffee! I adore that you have kept such a good record of your blessings. It really is an encouragement to me. As I read through the list I think of my own love of bread, geese, running errands with my husband. And yaaaaa for you that you have the opportunity to speak at a conference Elizabeth!!! Whoop! I need to call you and catch up on the news with you re. being asked to speak at one of the breakout sessions at a conference. Love you bunches my friend. How could I forget to mention how handsome your grandson is! Darling!!! Thank you! I think he's pretty cute too.